Background: (Source: GoogleMaps); Right: (Source: Twitter / @aldin_ww). 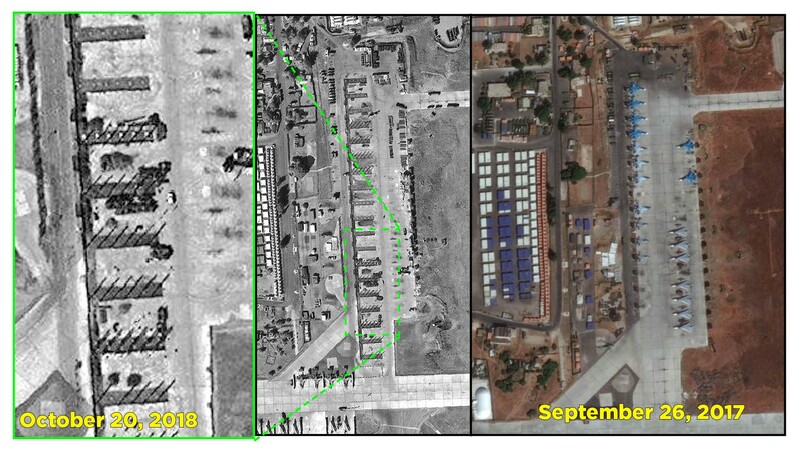 Fresh high-resolution satellite imagery exposed Russian construction of new aircraft shelters in Khmeimim Air Base. 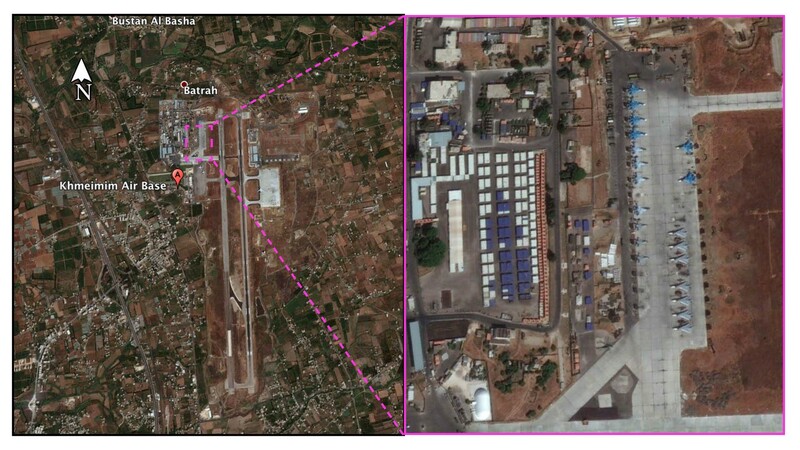 The Russian-run Khmeimim Air Base in Latakia, Syria, has been attacked numerous times in the past, resulting in damaged aircraft and military personnel casualties. After the attacks in early 2018, some security measures were installed to protect the aircraft from possible attacks. 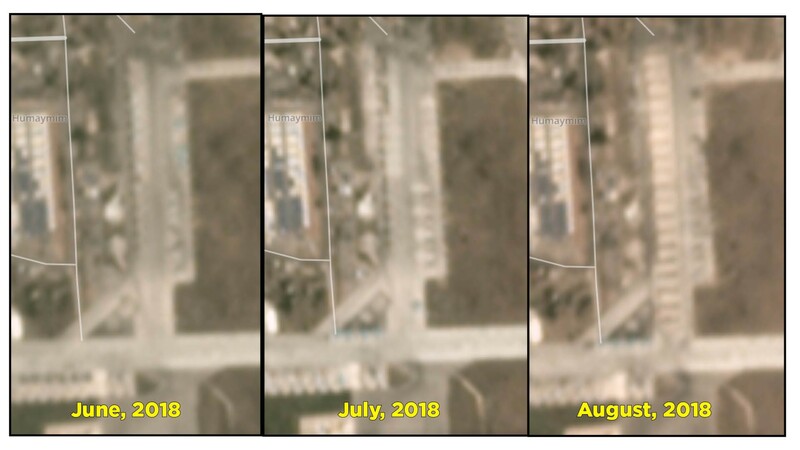 The latest drone attack on Khmeimim took place on August 14, 2018, when five drones were reportedly shot down by Russian air defense systems. The latest satellite imagery analysis of the base revealed that new security measures are currently under construction. These findings suggested not only that the threat of attacks remains imminent, but also, that the Russian Air Force is likely planning for a protracted presence in Syria. On February 21, 2018, @DFRLab reported that Russian Su-57 fighters (PAK-FA / T-50–4) were deployed in Khmeimim Air Base. 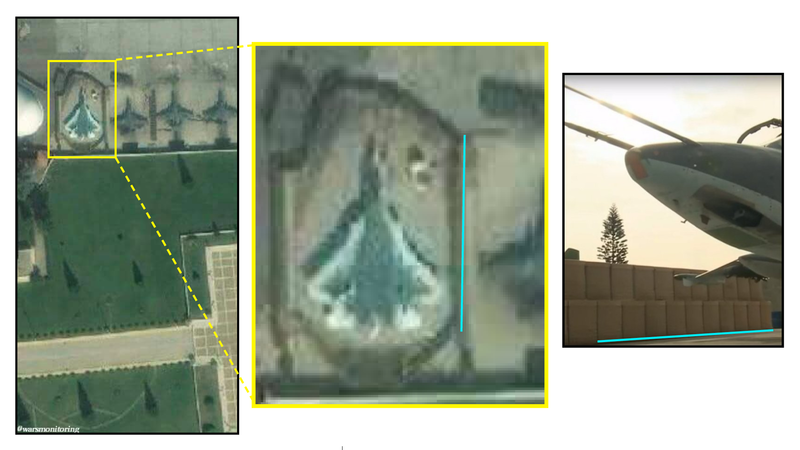 The available satellite imagery showed that a newly deployed Su-57 fighter was protected with a defensive barrier around it. The protective barriers were installed to prevent collateral damage to the nearby aircraft in case of an attack. These additional security measures suggested that Russian Air Force commanders perceived the threat as genuine, and anticipated further attacks in the future. Su-57 with defensive barrier. Left, Center: (Source: Twitter / @warsmonitoring); Right: (Source: Twitter / @reutersanders). Recent high resolution satellite images revealed construction in the northern airfield apron, where most of the Russian aircraft were parked. These images showed a large construction project taking place in the lots where the airplanes were parked earlier. The silhouettes of the probable aircraft shelters appeared to be large enough to hold aircraft and steel framework of the construction was already installed. High resolution satellite imagery compared with an image from September 26, 2017. Left: (Source: Twitter / @aldin_ww); Right: (Source: GoogleMaps). These findings were cross-checked with and supported by monthly Planet satellite imagery. Construction of the new aircraft hangars started in June 2018. By July, all the aircraft were removed from the apron. The first laid aircraft shelter foundations were also visible in July. While visiting Khmeimim Air Base on December 11, 2017, Russian President Vladimir Putin announced that the Russian forces would withdraw from Syria. Nonetheless, Russia’s continued military support for Assad’s regime in fighting the Syrian rebels suggests otherwise. The construction suggests that Russian forces in Latakia are preparing for a long-term stay. According to a recent TASS report, Russia currently has an agreement with Assad’s regime to use the base for more than 40 years. Despite Putin’s message of withdrawal last December, the Khmeimim Air Base is currently receiving security upgrades. The new reinforced concrete aircraft shelters were likely a response to frequent attacks on the base and would help to prevent further aircraft damage and casualties to personnel. This development suggests that Russian forces in Latakia are preparing for a long term stay. Taking into consideration recent military involvement in fighting Syrian rebels, the Russian Air Force will continue to play a key role in upcoming battles. @DFRLab will continue to monitor Russian military operations and other involvement in the Syrian conflict.